Staff at South Tyneside NHS Foundation Trust are being encouraged to give up once and for all as part of a bid to become a completely smokefree organisation. According to figures from Action on Smoking and Health (ASH), the estimated annual cost of smoking to the NHS in South Tyneside is about £7.1 million a year. The Trust is therefore offering a support programme for NHS staff, as well as their friends and family, recognising the vital role loved ones can play. They will have access to a full range of products, including patches and gum, and medications such as Champix and Zyban. South Tyneside NHS Foundation Trust medical director Dr Shaz Wahid said “We are working closely with our local partners to get us to the point of becoming fully smokefree and, as part of this, we want to give our staff and patients all the tools and support we can to help them to stop smoking. More than £100,000 of unaccounted-for cash plus a stash of illegal tobacco has been seized in a joint Trading Standards and police raid. Lancashire County Council Trading Standards and Lancashire Police seized the tobacco from a shop in Nelson town centre, and the £100,000 cash in bags from a house in the town. Officers served three warrants, all in the Nelson area, after tracking a supply ring operating in the town. More than 680 tobacco packs, with a retail value of around almost £4,000 were seized from a locked hiding place. Three men and a woman are currently under investigation, and checks into the supply chain are continuing. The traders involved face possible prosecution by Trading Standards in relation to offences under the Trade Marks Act 1994 and The Tobacco and Related Products Regulations 2016. 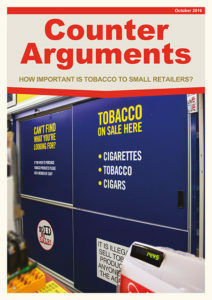 A detailed study from the Tobacco Control Research Group at the University of Bath, using a range of sources including internal documents and whistleblower testimony, claims the tobacco industry is now going to elaborate lengths to control the global “track and trace” system that the United Nations has said must be put in place to counter smuggling. Tobacco companies complain about the smuggling of cheap illegally-made copies of their brands, but two-thirds of the illicit tobacco market is made up of genuine product, says the study published in the journal Tobacco Control. “At best, evidence indicates that tobacco companies are failing to control their supply chain, over-producing in some markets (eg Ukraine) and oversupplying others (eg Belgium) in the knowledge their products will end up on the illicit market,” says the paper. To ask the Secretary of State for Health and Social Care, what progress his Department has made with Public Health England Tobacco Implementation Board on implementing the recommendations of the Independent Cancer Taskforce; on what date his Department has held meetings with that Board; and who attended those meetings. The ‘Tobacco Control Plan for England: Towards a smoke-free generation’, published in July 2017, takes into account the recommendations of the Independent Cancer Taskforce, and focuses on reducing smoking prevalence within priority groups such as people with mental health conditions, people in routine and manual occupations and pregnant women, tackling the associated health inequalities. A special meeting of the Public Health England Tobacco Control Implementation Board was held on 20 December 2017 to discuss the Plan. I chaired the meeting which was attended by representatives of the Department, Public Health England and key stakeholders including Cancer Research UK, the Royal College of Physicians, British Medical Association, British Thoracic Society, Action on Smoking and Health and the UK Centre for Tobacco and Alcohol Studies. This briefing is a position statement by Action on Smoking and Health and FairPensions which aims to inform stakeholders in local authority pensions, including councillors, pension fund members, local taxpayers and pension fund trustees. Following the decision by the UN Global Compact in September to exclude the tobacco industry, the International Labour Organization (ILO) will decide shortly whether it, too, will finally sever ties with Big Tobacco. The decision, set to come at its governing body meeting at the end of October, could close one of the tobacco industry’s last-remaining avenues of influence to the United Nations. The decision comes as public health and labour leaders from around the world delivered a letter  this week to government representatives of the ILO Governing Body calling on them to end the ILO’s public-private partnerships with the tobacco industry. Global public health leaders from the Secretariat of the World Health Organization Framework Convention on Tobacco Control (WHO FCTC)  to global tobacco control organizations  have long called for the ILO to shut its doors to Big Tobacco. Since 2015, the ILO has received more than $15 million USD from tobacco corporations for joint programs, including more than $10 million from Japan Tobacco International for its Achieving Reduction of Child Labour in Supporting of Education (ARISE) program. The industry promotes these programs to boost its public relations,  but they do little to curb child labour in tobacco fields because they do not shift the tobacco industry-driven cycle of poverty for tobacco farmers that forces children into the fields. The ILO’s links to the tobacco industry violates a core tenet of the FCTC, which establishes a firewall between the tobacco industry and public health policymaking. ILO should vote to keep the tobacco industry from the policy table. Press release. Vital Strategies. 15 March 2017. Reducing the worst forms of child labour in tobacco-growing communities in Brazil, Malawi and Zambia: Public-Private Partnership. ILO website. 6 October 2015. Otanez M, Glantz S, Social responsibility in tobacco production? Tobacco companies use of green supply chains to obscure the real costs of tobacco farming. BMJ Tobacco Control. April 2011. World Health Organisation, Article 5.3 of the WHO Framework Convention on Tobacco Control. A briefing for Local Authorities to help them meet their obligations as parties to the World Health Organization treaty on tobacco, the Framework Convention on Tobacco Control (FCTC – article 5.3) and to the Local Government Declaration on Tobacco Control.